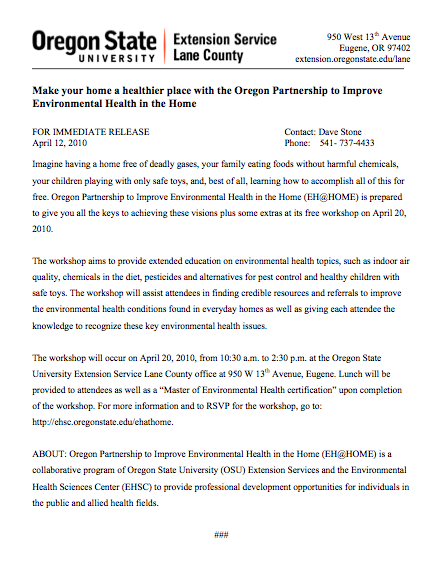 I presently (spring term 2010) supervise a team of three in all public relations work performed for client, Oregon State Univeristy Extension Service, Lane County. 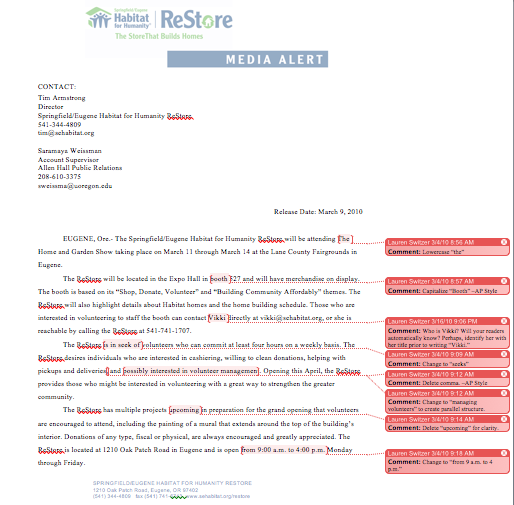 This includes managing, monitoring and contributing to OSU Extension Lane's social media; writing news releases, feature stories and e-newsletter pieces; and editing all written work completed by my team. 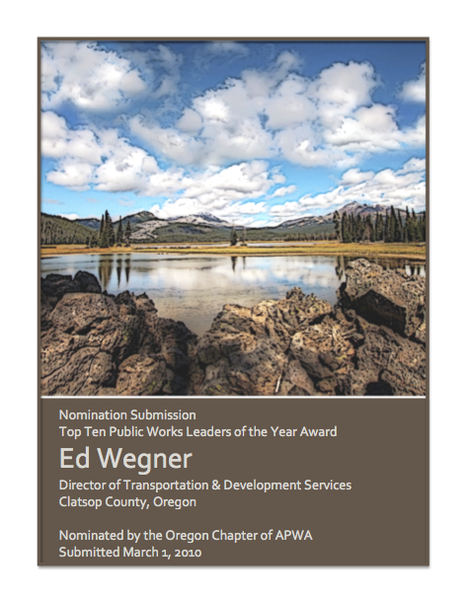 Winter term 2010, I successfully managed a team of four in creating a 34-page nomination packet for client, the Oregon chapter of the American Public Works Association, in seven weeks. I also wrote feature stories and articles for each section of the nomination packet. 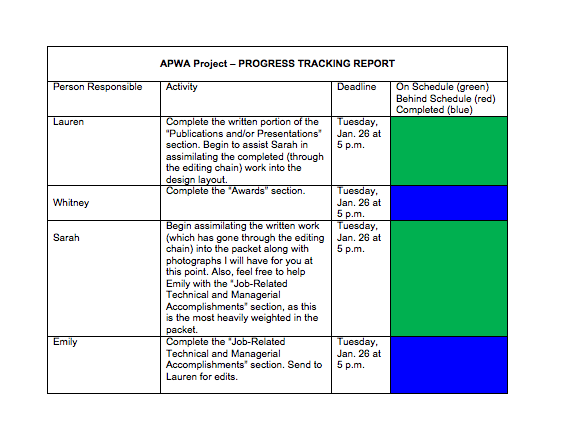 This was a very deadline-driven account, and so I created a progress tracking report (displayed below) to successfully hold my team and myself to deadlines. The client was incredibly impressed with the finished product, having not edits whatsoever. 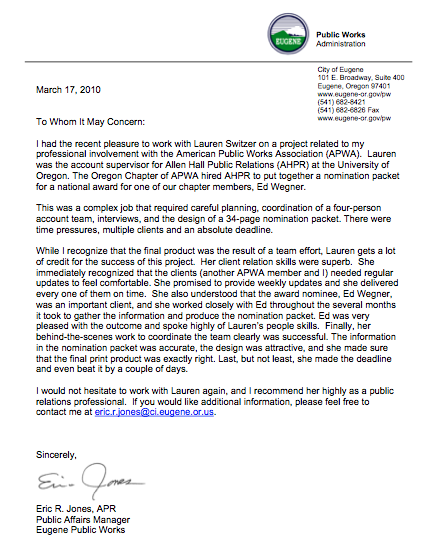 From January 2010 through March 2010, I planned an executed an event for the top 100 University of Oregon Junior Scholars. The event was a great success with it coming in under budget and having an increase in attendance from years past. My fellow Co-Chair and I were able to arrange for the Dean of Students, Paul Shang, to speak at the event. 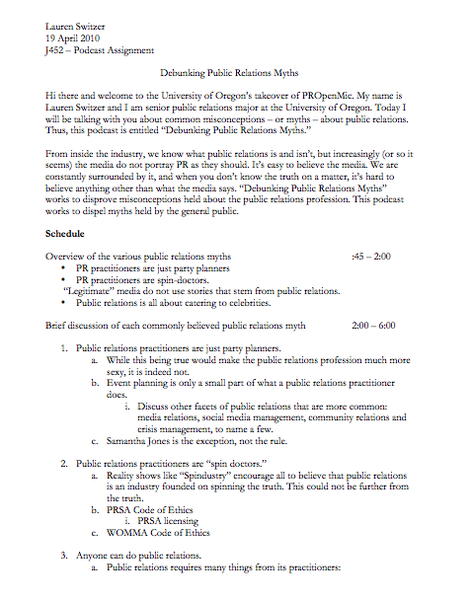 I was elected as Vice President to the University of Oregon's chapter of the Public Relations Student Society of America in May 2009. 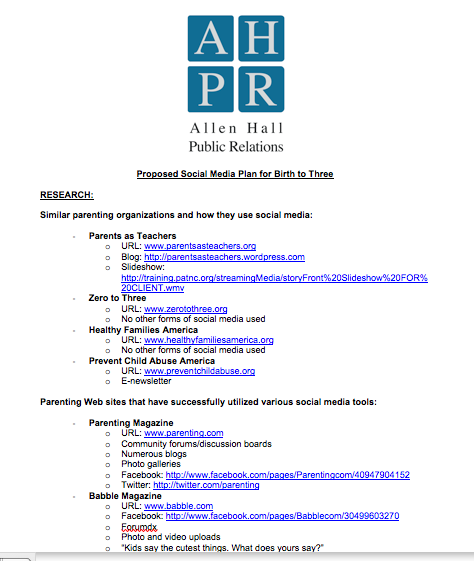 Since that time, I have drafted news releases about PRSSA events, with one gaining national recognition on the main PRSSA website (as seen below in the portfolio section). I also assissted in organizing and hosting the 2010 PRSSA Spelling Bee, which raised more than 50 pounds of canned food for the local food bank, Food for Lane County. Winter term 2010, I was chosen as Director of Editorial Services and an Account Supervisor out of a pool of 46 candidates. 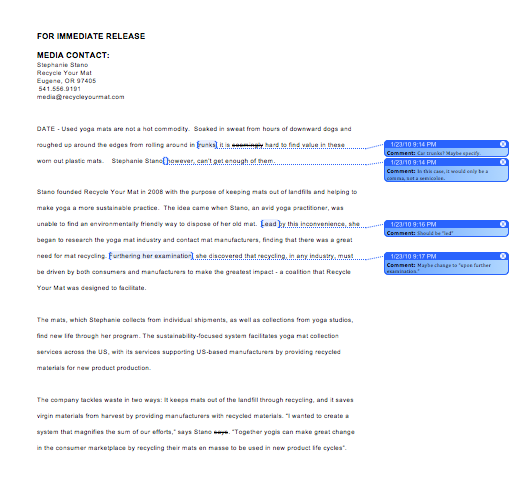 I was responsible for editing all client work produced by the 46 employees of AHPR for proper grammar and AP Style. I was hired as an intern at Edelman Worldwide in September 2009. During my time at Edelman, I performed extensive online, hardcopy and media research for all clients, including Shell, Bosch Electronics, 1Goal and CTEK. 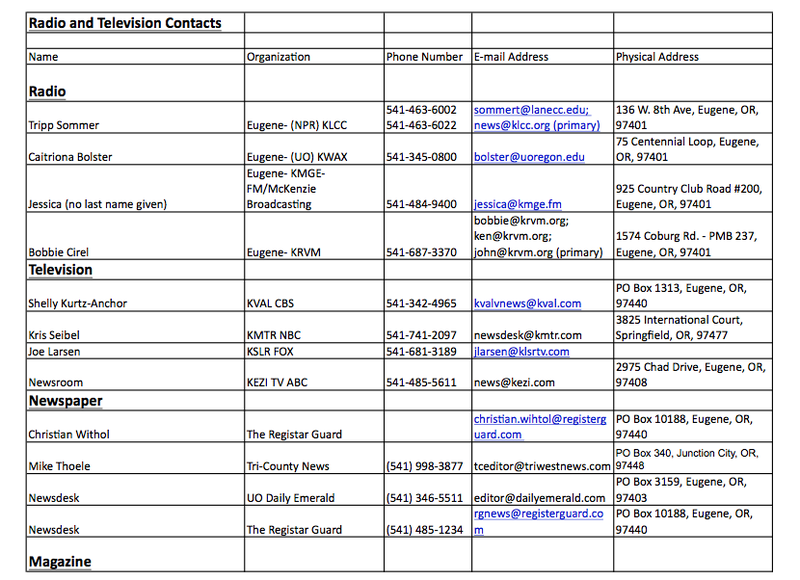 I also compiled a plethora of media lists, wrote news releases and advertorials and compiled media coverage records. 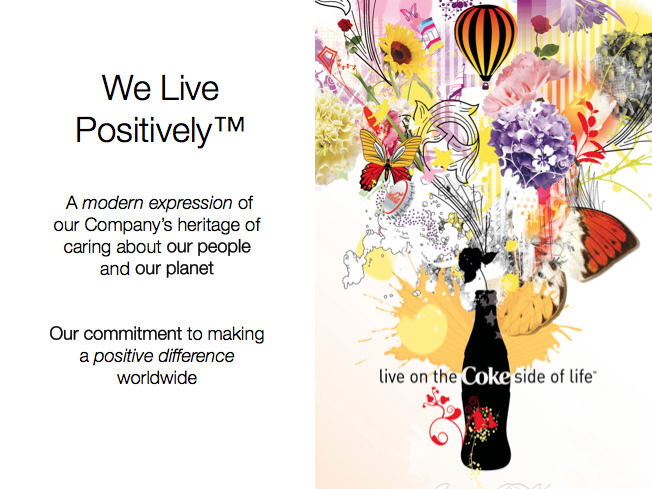 Overall, I gained a greater understanding of intercultural business relation by working at Edelman abroad. 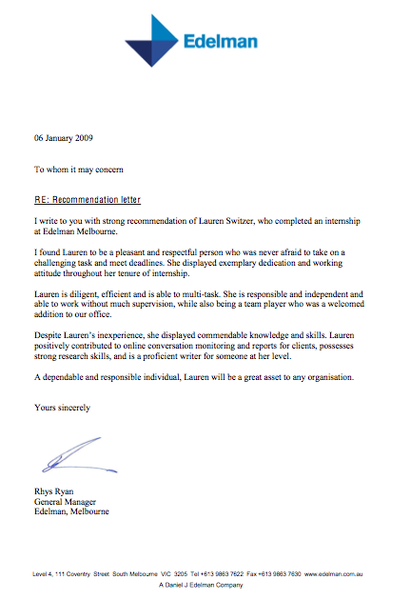 My General Manager, Rhys Ryan, was so impressed with my work that he wrote a very flattering letter of recommendation, which is displayed below. 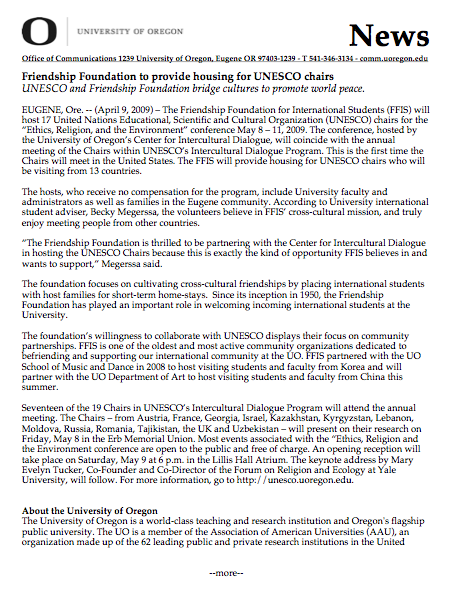 The University of Oregon's Center for Intercultural Dialogue was the primary news source for the 2009 UNESCO Chairs Conference in Eugene, Ore. and I was hired as an Assistant Media Relations Project Leader to assist in media relations for the Conference. This was the first ever UNESCO Chairs Conference held on U.S. soil. 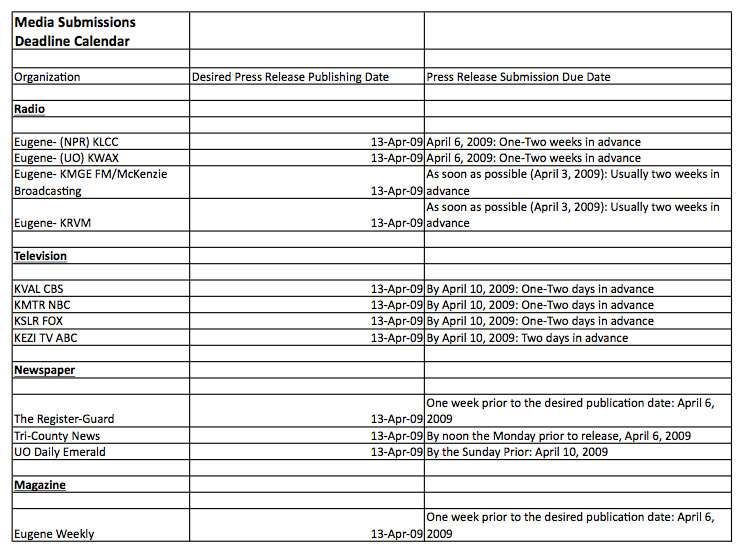 I created a variety of media lists for the Conference and created a media submission deadline calendar as well. 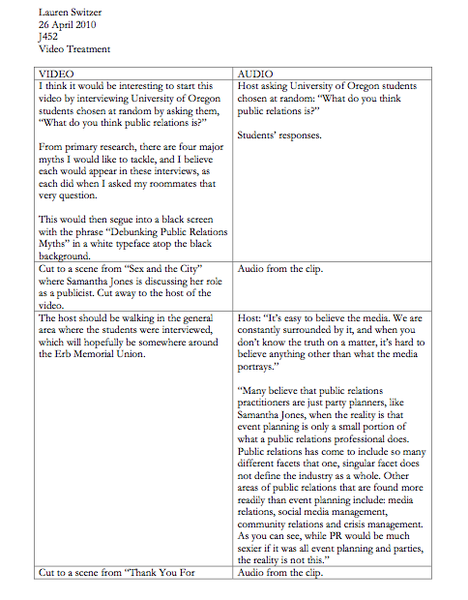 I was also responsible for drafting news releases with my fellow Assistant Media Relations Project Leader, Sarah Lilly. 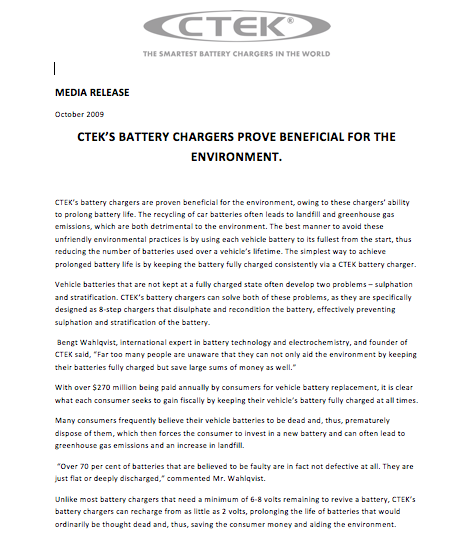 The Conference was a huge success and received ample media coverage. 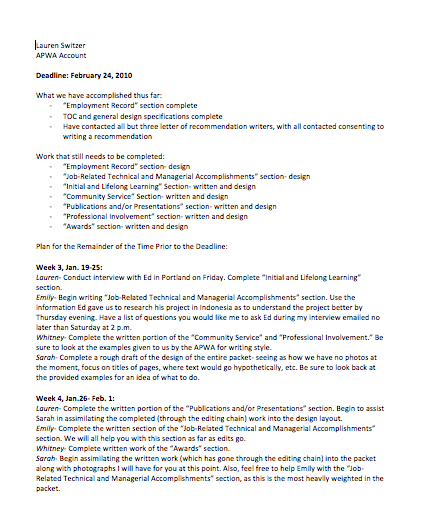 I was hired as an Account Executive to the University of Oregon's student-run public relations agency, AHPR, in January of 2009. I was placed on the Birth to Three account along with two other Account Executives and one Account Supervisor. During this time, I was responsible for assisting in the creation of a social media plan and presentation for the client as well as gathering testimonials for the client, Birth to Three. 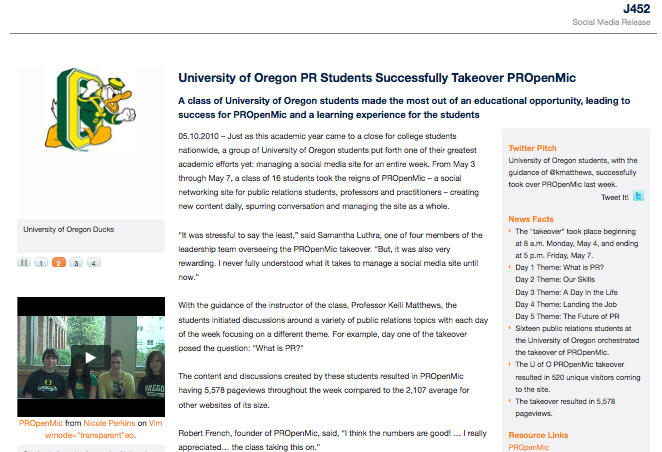 I was elected as the President of the University of Oregon's chapter of the Society of Professional Journalists in January 2009. My duties included: coordinating SPJ's bi-weekly meetings, publicizing all SPJ events, and inviting interesting and relevant speakers to meetings, including former President of the National Association of Black Journalists, Will Sutton, and New York Time's reporter Cornelia Dean. During my presidency, club membership increased from seven members in fall 2008 to 40 members in June 2009. TsaiComms LLC is a cross-cultural communication agency with clients such as Nike. TsaiComms teaches its clients the proper etiquette of other cultures to make business transactions run more smoothly. 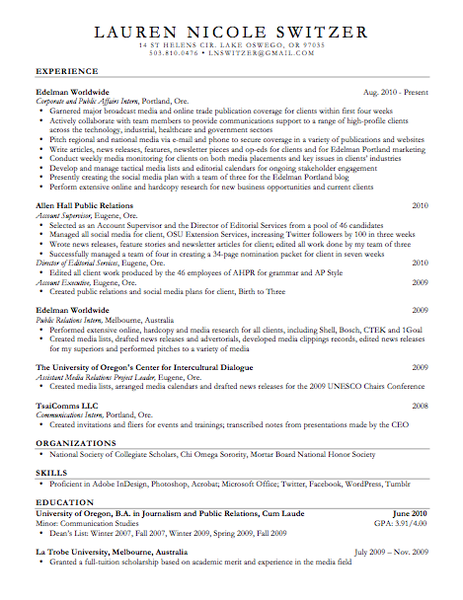 I was hired as a communications intern in February 2008. While interning, I created invitations and fliers for events and trainings TsaiComms presented. I also transcribed notes from presentations made by the CEO Lillian Tsai on the proper mannerisms to use when working with people from other countries. I directed a staff of up to 5 people while maintaining a high level of enthusiasm and customer satisfaction. 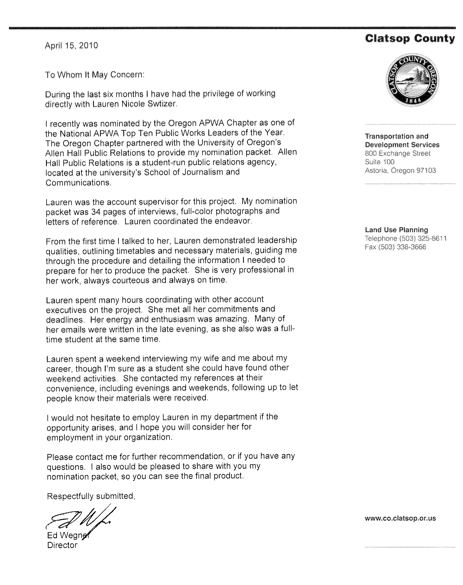 I was recognized by my supervisor for having strong leadership skills; accuracy in maintaining financial records; trustworthiness and excellent communication skills with customers and employees. I suggested a new manner to clean the floors after mopping, which was adopted by this Coldstone and is still used today while at this entry-level position. I was recognized by my supervisor for having excellent leadership skills, even though at this time I was still inferior to the Shift Leader; this lead to my eventual promotion. Hi there! My name is Lauren Switzer, and I am a senior public relations student with a minor in communication studies at the University of Oregon. I graduate this June (2010) and am currently seeking employment. I have experience working at a small, intercultural communications agency, a student-run public relations firm, various nonprofit organizations and an international public relations agency. From July 2009 through November 2009, I had the amazing privilege of studying abroad in Melbourne, Australia. While there, I also had the opportunity to intern at the Melbourne office of Edelman Worldwide. 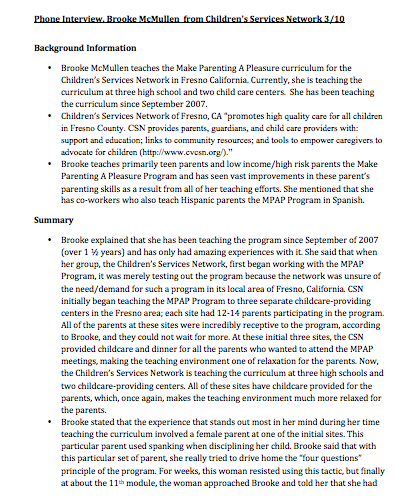 This experience made me all the more passionate about public relations and agency work in particular. I hope to convert this passion into a career in the near future. I also have media clipping records, two, extensive online commentary discussion reports, an edited news release originally written by one of my superiors and a written advertorial in my hard-copy portfolio. Due to the sensitive nature of the documents, I cannot display them on a public website.